Stock status is current as of 4/23/2019 8:21 PMET. 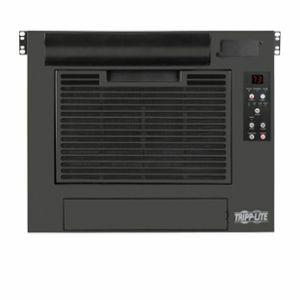 The Tripp Lite Rackmount Cooling Unit pumps approx 7,000 BTU/h (2.0 kW) of close-coupled cooling power inside your IT equipment to prevent shutdowns, malfunctions, and failures which are caused by overheating. This cooling unit is space-saving and energy-efficient, perfect for data centers, server rooms, network closets, and other environments. The self-contained cooling unit mounts just like any other rack equipment in 8 unit of space residing on top or bottom of a rack enclosure. 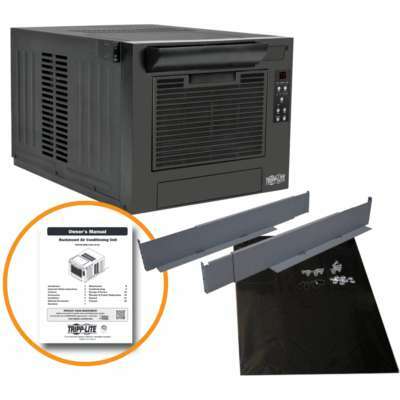 It has a magnetic air dam which is attached to the front door of the rack enclosure to ensure that equipment releases cool air from the Rackmount Cooling Unit, instead of drawing warm air from the room. As it only cools the equipment resided inside the rack enclosure, the cooling unit is much more efficient than solutions that cool an entire room which achieve the same result. 7000 BTU/h pumps cooling power inside your IT equipment. 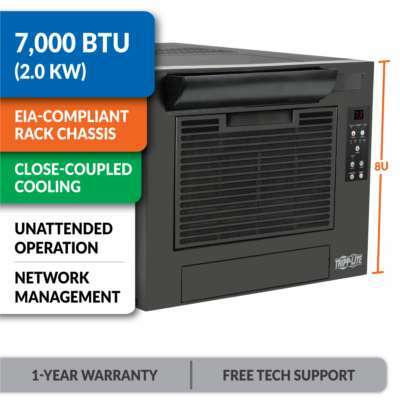 The SRCOOL7KRM is the first EIA-compliant rack-mounted air conditioning unit designed to cool IT equipment. 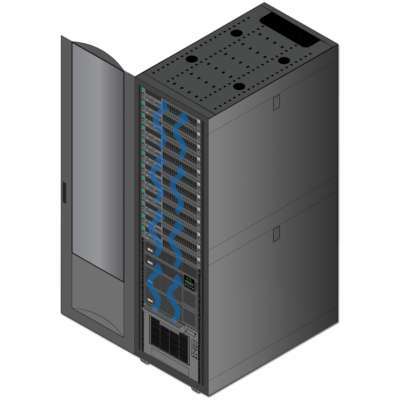 It cools up to 2.0 kW of rack-mounted equipment in a server room, MDF or network closet. It also filters and dehumidifies air. 7,000 BTU/h (2.0kW) of cooling prevents heat-related IT equipment malfunctions, damage and downtime. 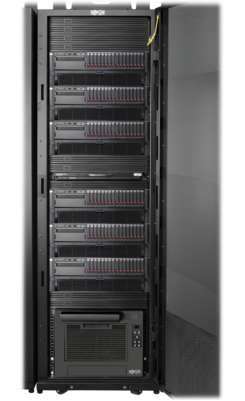 EIA-compliant rack chassis (8U) saves valuable floor space in cramped IT environments. Close-coupled cooling saves energy and reduces operating costs. Prevents accumulation of condensation and restarts automatically after outages for unattended operation. 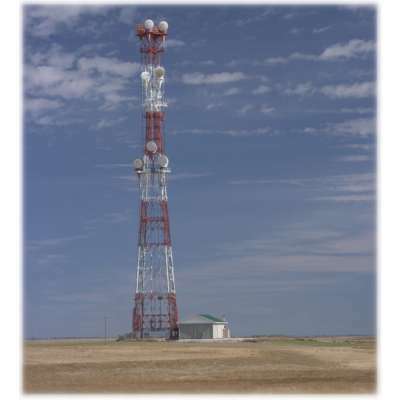 Optional network management cards enables remote monitoring and control. 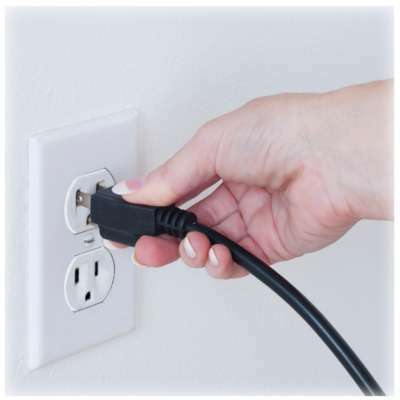 Self-contained unit plugs into a standard 15-amp outlet for plug-and-play installation. 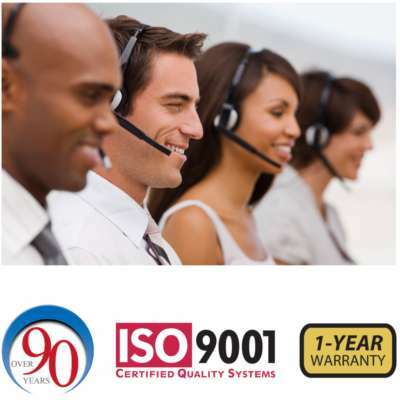 1-year warranty and free tech support reflect Tripp Lite's commitment to customer satisfaction. Why is the SRCOOL7KRM a Good Investment? This rack-mounted air-conditioning unit solves cooling problems where it isn't practical, efficient or affordable to install or expand computer room air conditioning (CRAC) or HVAC capacity. When IT equipment is installed in an improvised space or new equipment overwhelms existing cooling systems, additional cooling is required to ensure reliable performance and prevent damage. This air conditioning unit provides the cooling capacity to solve heat-related problems without requiring a major capital expenditure, a disruptive construction project, installation assistance from costly specialties or time-consuming maintenance. It's ideal for sectors like education and small/medium business, where budgets are tight and purpose-built IT spaces are a luxury. The difference between consumer-grade air conditioners and SmartRack® cooling solutions is like the difference between home computers and purpose-built servers. Although it may be possible to install server software on a home computer, it will never have the convenience, manageability, performance and resilience required for a high-availability IT environment. Tripp Lite has engineered SmartRack cooling solutions from the ground up to meet the rigorous requirements of IT environments. Since the introduction of the award-winning SRCOOL12K, Tripp Lite has also used customer feedback and extensive IT application testing - both in the field and the lab - to improve SmartRack cooling solutions in every aspect from internal design to external packaging. Installing air conditioning units closer to heat sources reduces distances required for delivery of cold air and removal of hot air, using less electricity to power fans. Close-coupled cooling also focuses cold air where it's actually needed instead of wasting energy to cool the entire room when that isn't the goal. This makes close-coupled air conditioning units more efficient than air conditioners installed at the room's perimeter or outside the room entirely, saving energy and reducing operating costs. Because close-coupled cooling is modular, it also allows you to reconfigure cooling on the fly to handle new equipment or newly detected hot spots. Loaded with IT-friendly features that allow it to operate for extended periods without user intervention, this air conditioning unit is ideal for remote installations and other low-maintenance applications. After you plug it in and turn it on, you can focus on other tasks without interruption while it keeps things cool. The built-in evaporator prevents condensation from accumulating, which means that you never need to empty a water collection tank. If there's a power failure, the unit restarts automatically with its most recent settings, so you don't need to make a site visit to get things running again. You can also set the unit to turn on and off automatically. And if you want to keep a closer eye on cooling, the optional SRCOOLNET2 network management card allows you to monitor and control every aspect of the unit's operation from any location without leaving your desk. Use the push-button control panel, LEDs and digital display to change settings, automate operation and monitor temperature locally. Add the optional SRCOOLNET2 network management card to monitor temperatures, change settings, define threshold warnings, receive alerts, access logs and automate operation over the network via SNMP, Web, SSH or telnet. 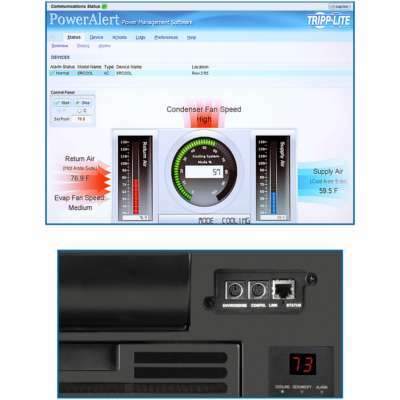 Using Tripp Lite's free PowerAlert® NMS software, you can manage multiple air conditioning units from a central location and single interface. The SRCOOLNET2 also includes an ENVIROSENSE® temperature, humidity and dry contact sensor. The sensor allows cooling operation to be based on temperature readings up to 12 feet away from the air conditioning unit, providing more precise cooling control. This air conditioning unit can be installed by almost anyone, without the assistance of an electrician or HVAC specialist. It mounts just like any other rack equipment and plugs into a standard 15-amp outlet. The unit is completely self-contained and a built-in evaporator prevents condensation from accumulating, so it does not require an external condenser, refrigerant piping, floor drain or water collection tank. It ships with all the parts required for installation, including 4-post mounting hardware compatible with standard EIA-compliant rack enclosures. 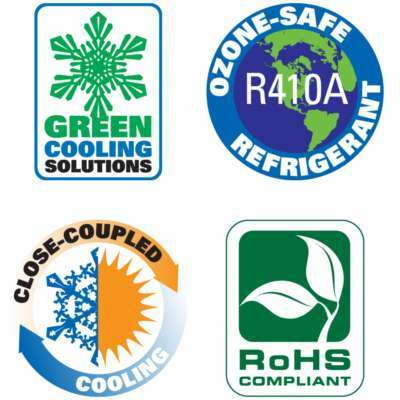 Ozone-Safe Refrigerant: This air conditioning unit's R410A refrigerant complies with environmental standards worldwide and does not contribute to ozone layer depletion. Close-Coupled Cooling: Closed-coupled cooling systems are more efficient than traditional perimeter cooling systems. Close-coupled cooling helps you save money, save energy, reduce carbon emissions and protect the environment. RoHS Compliance: This product complies with the RoHS (Restriction of Hazardous Substances) Directive, which limits the use of hazardous substances in manufacturing. 1-Year Product Warranty: If this product proves defective in material or workmanship within that period, Tripp Lite will repair or replace it at no charge. Tripp Lite has a policy of continuous improvement. Specifications are subject to change without notice. Actual products may differ slightly from photos. Tripp Lite uses primary and third-party agencies to test its products for compliance with standards. Go to Tripp Lite's website for more information, including complete warranty terms and conditions.